Rocketboom, the daily video blog, is turning over its distribution and ad sales to Sony Pictures Television in return for a seven-figure guarantee plus a share of revenues. Rocketboom will be distributed on Sony’s Crackle video site, as well as across other Sony platforms such as the PS3, PSP, and Bravia I-Link TVs. Rocketboom founder Andrew Baron says he went with Sony because of Sony’s distribution strengths and the deal allows him to maintain control of the business. (Whereas selling the business to another media buyer, such as WallStrip did to CBS a year ago for $5 million, would have required him to give up his baby). The deal is structured as a distribution and advertising deal, and sounds like it could lead to a closer relationship or outright sale if things go well. But if they don’t, Rocketboom would regain complete control of distribution and ad sales after the contract expires. Rocketboom’s current distribution through YouTube, iTunes, Tivo, and elsewhere will remain intact. Sony will sell ads across those distribution channels as well. Baron claims more than Rocketboom is watched more than one million times a month across all channels, and sometimes spike to several million views. But as one of the first Web video shows, Rocketboom has always been better at creating videos than at selling ads. By aligning with a major media company, Rocketboom will be able to expand its reach and Baron will be able to take some money off the table. But Rocketboom will now be seen as a Sony property for all intents and purposes. That is not necessarily a bad thing. For instance, Crackle is finally starting to see some growth after going nowhere for a long time. 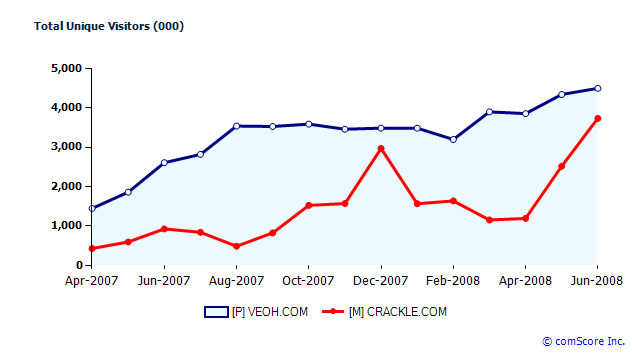 Since April, according to comScore, unique U.S. visitors to Crackle.com has tripled to 3.7 million (compared to 4.5 million U.S. visitors to Veoh.com). The deal does raise the question, though, of whether Web video startups can thrive as independent entities or require the distribution muscle of a major media company to go mainstream. We tried start-up ad companies like Federated Media and blip.tv and refused to go exclusive with anyone for a long term without some kind of guarantee. And no one was ready because no one could sell out our inventory across all of our platforms (e.g. our own video formats plus videos on You-Tube and TiVo, etc.). It tends to require managing multiple accounts and methods and no one has been able to handle selling ads across all of our platforms except us. He also blames a lawsuit with former Rocketboom anchor Amanda Congdon for tying up the company for two years. While other Web video startups, such as Revison3 and Next New Networks, raised tens of millions of dollars, Rocketboom was “frozen like ice” by the courts.